Head of French energy group Total has indicated that instructions from Paris and Washington will not deter him to do business with Teheran in reference to US sanctions against foreign companies dealing with Iran. President Trump who has threatened to tear up 2015 nuclear deal between Iran and world power is expected on October 15 to certify whether Teheran has been in compliance with the agreement or not. If President Trump administration does not certify Teheran’s adherence with the deal, the US congress could consider reinstating sanctions. Patrick Pouyanné who heads the French group notes that any deal with Iran would be at stake. The French group signed in July a deal with the Islamic Republic to develop part of its South Pars gas field. The deal has been estimated at $4.8. The deal is the first between the Islamic Republic and a European company, following more than a decade of international isolation. Pouyanné noted that he knew that the road will not be easy but referred to land a deal than having no opportunity. The French CEO also stressed that Total is committed to the deal and will go ahead to execute it. “I don’t receive any order from the French government. I don’t receive any order from the US government . . . I respect the fact that each country can have its own foreign policy and of course . . . we take that into account,” he said. 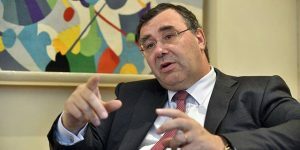 Pouyanné told the Financial Time that he does not whether US President will certify Iran’s behavior with regards to deal, or what US Congress will decide even though important voices within the US institution last week urged the US President to heed calls to remain faithful to the deal.